Joyce Meyer Word for Today Devotional. There was a story of Apostle Paul in Acts 27, He was traveling with some folks by ship when a violent wind hit them, the storm was so fierce. The next day as gale-force winds continued to batter the ship, the crew began throwing the cargo overboard. The terrible storm raged for many days, blotting out the sun and the stars, until at last all hope was gone. How could the Apostle Paul , in the midst of life threatening storm, ask the people to be courageous ? Because he trust in the settled word of God , that it will be exactly as it was told him by the Angel. That is a great picture of confidence in the word of God. It look like the story of Abraham who against hope believed in Hope [Romasn 4:19-21]. And we all can demonstrate this kind of faith if we will overcome doubt. We all face challenges and storms of life at some point in our lifetime. But in the midst of life challenges we can remember the promises of God. “And we know that God causes everything to work together for the good of those who love God and are called according to his purpose for them”[Romans 8:28}. Remember Joseph, how God used his challenges to position him for greatness, most of your challenges will humble you to seek the face of God and to establish a better relationship with Him. But you must have faith in the written word. Doubt is a type of “flaming arrow” that the enemy uses to attack our faith, [Hebrews 11:6] says “And without faith it is impossible to please God, because anyone who comes to him must believe that he exists and that he rewards those who earnestly seek him”. you must demonstrate trust in the word of God to come out triumphantly from every changeling of life. 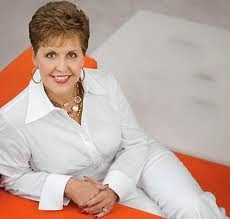 JoyceMeyer is a Charismatic Christian author and speaker. Her ministry is headquartered in the St. Louis suburb of Fenton, Missouri. The scripture posted above should be Romans 8:28 not Romans 8:2 I know it is just a typo that you may want to correct.